In a powerful speech delivered Sunday, presidential hopeful Pete Buttigieg said that there was a time when he would have done anything not to be gay. 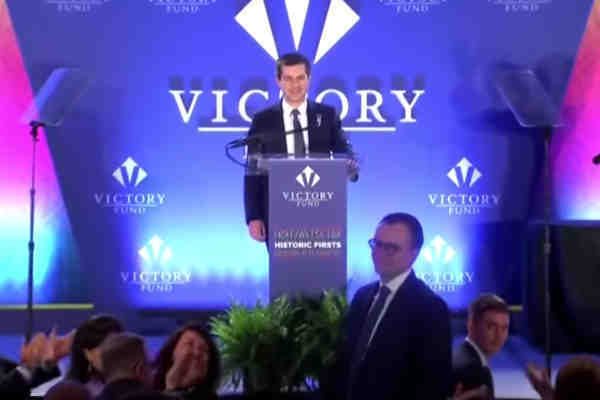 Speaking at an LGBTQ Victory Fund brunch in Washington, D.C., Buttigieg, who married his husband Chasten last year, reiterated that he came out because he was ready to fall in love, but getting to that point was a struggle for the 37-year-old mayor of South Bend, Indiana. “Thank God there was no pill. Thank God there was no knife,” he added. Buttigieg also took a swipe at Vice President Mike Pence, the former governor of Indiana and a vocal opponent of LGBT rights, including marriage equality. “Being married to Chasten has made me a better human being. … And yes Mr. Vice President, it has moved me closer to God,” Buttigieg said. In introducing his husband, Buttigieg said that America was falling in love with Chasten, just like he did.